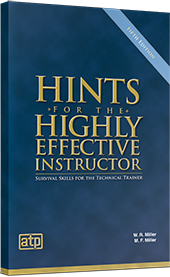 Hints for the Highly Effective Instructor is a popular publication that presents field-tested topics related to teaching and learning. Designed for both new and experienced instructors, information is organized for quick access and easy implementation. As a concise reference, it can be used in conjunction with in-service training seminars and staff orientation. This new edition also addresses the latest trends in technology applications used in instruction including serious games, content curation, and massive open online courses (MOOCs).